So you want to channel your inner psychic. The thought of doing so excites you so much that you’ve already started looking at tarot card decks. As happy as we are for you, you might want to hold your horses. Tarot card reading isn’t as simple as buying a deck, arranging some cards, and prophesizing events yet to come. There are card types to be studied, arrangements to consider, and intuition to be relied on. While this sounds like a lot, getting the basics down is easier than you think if you have the right guide. Luckily for you aspiring card readers, the right guide is already in the cards for you. The only thing you have to do is keep reading. Before we dive into anything about spreads or intuition, we’d like to first discuss the makeup of a tarot card deck. You can’t, after all, successfully attempt tarot card reading without understanding how a deck is structured. Having said this, we’re going to provide some basic information about major and minor arcana in this section. We’ll also count the number of arcana as we go along in order to arrive at a typical deck’s total number of cards. The major arcana are often viewed as the most important cards in a deck. While this isn’t altogether true, they do play an extremely important role in tarot card readings. Each major arcana card has an image on it that can be interpreted by the reader. Some examples of the images that can be found on these cards include the fool, the chariot, and the hanged man. There are 22 major arcana per deck. As you’ll soon find out, they make up a much smaller portion of the deck than the minor arcana. You might also hear people refer to them as “Majors,” “Keys,” “Triumphs,” or “Trumps” since they’re so instrumental to the deck. Thinking of the minor arcana as somehow less important than the major arcana is tempting, but they play a vital role as well. The minor arcana are divided into what we think of as suits. Just like a standard deck of playing cards, the minor arcana consists of four suits. The first of those is the Pentacle suit. Pentacles are often associated with money and career issues. The second suit is the Cups suit. Cups are thought to portend emotional issues. The third suit is the Wand suit. Wands are correlated with spiritual issues. The final suit is the Sword suit. Swords are somewhat different from the other suits in that they aren’t related to physical and intangible issues in the same way as the other suits. Readers often see this as a sign of a negative experience or loss, which is somewhat vague compared to the other suits’ interpretations. You should note that there are also other interpretations for these suits. Swords, for instance, are also said to represent our ability to understand our beliefs and our influences we have on those around us. There are 56 minor arcana in a tarot card deck. If you add that number to the 22 major arcana, you get a grand total of 78 cards. Though there is much more to learn about the major and minor arcana, we couldn’t possibly cover all there is to know about them here. We have to move on to spreads, which are just as important as the cards themselves when doing a tarot card reading. They help readers organize their cards in a logical way. There are admittedly many spreads, so we’ll only cover a few here. Since this is a guide for beginners, the spreads we cover will be simple. The one-card spread is the simplest of the spreads we’ll discuss here. As its name suggests, the spread only requires that you place and interpret a single card. This is a great strategy for beginners who would feel overwhelmed by the presence of multiple cards on the table. A nascent reader need only draw one card, ask him- or herself a question, and then reveal that card. He or she should then interpret the card in order to answer the question that has been posed. Notice that we advised you to ask yourself a question when using this method. That’s because this method provides a limited reading and should predominantly be used to practice your tarot card reading. A three-card spread is a bit more complex than a one-card spread, but it’s still fairly simple. The reader must draw three cards using this spread. The first card represents the past, the second the present, and the third the future. There is also another use of the three-card spread. The meanings of the cards can be correlated with the mind, body, and spirit rather than the past, present, and future. As in the case of the one-card spread, you’ll need a specific question you wish to address with this spread. Precise questions about relationship troubles or career woes, for instance, are good options for a three-card spread. Unlike the other spreads here, freestyle spreads don’t follow any particular rules. 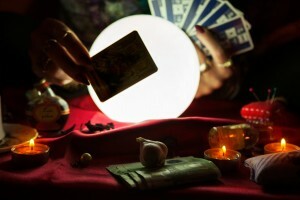 They allow the reader some flexibility when it comes to tarot card reading. This isn’t, however, recommended for complete beginners. Once you’ve mastered the one-card and three-card spreads, you can try your hand at freestyle spreads. Just make sure that there is some logic to your spreads. More than anything, providing a good reading is about intuition. Sure, knowing the usual meanings of the cards and mechanics of the typical spreads will help, but intuition is everything. For this reason, you have to work at truly understanding what the cards are telling you. You won’t be able to reach your full potential if you do everything entirely by the books. Want to Learn More About Tarot Card Reading? There is obviously so much more to learn about reading tarot cards. Sadly, we can’t teach it all to you here. Fortunately, our site is full of content which should help you get your bearings. And if you’re more interested in getting a reading than learning all of the fine details? Head on over to our Psychic Chat page to get in contact with a psychic.